Opower was founded in 2007 and secured an additional $50 million in funding last November. In 2010, the company doubled in size and by then had abated nearly 500 million lbs of CO2. And President Obama during a visit to their offices called the company "a model of what we want to be seeing all across the country." 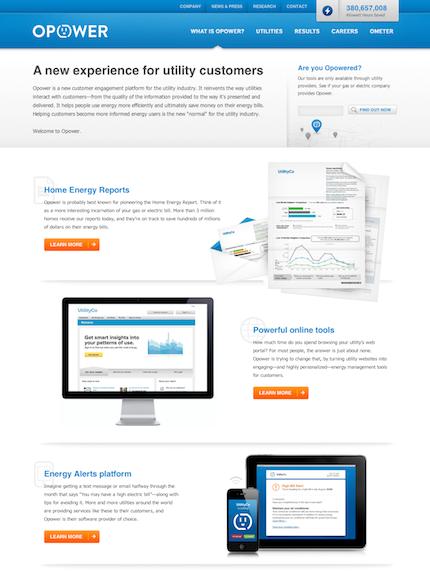 You couldn’t fully appreciate these accomplishments by looking at Opower.com a week ago. Like most companies who experience accelerated success, some aspects of the business play catch-up. Viget partnered with the energy-efficiency start-up to completely re-imagine Opower.com and elevate the site to a position reflective of the company’s continuing accomplishments and growth. This wasn’t just a redesign, however. A polished, compelling presentation is one way to solicit credibility, but the responsibility of Opower.com extends beyond putting on a pretty face. 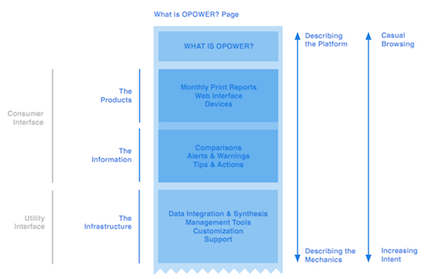 One of the site’s key goals is to answer the frequent question: What is Opower? It’s not as easy an explanation as you might think, particularly because Opower isn’t a product or service for which you as the average consumer can sign up. Through considerate user experience design, content strategy and visual presentation, we’ve helped answer this question in a way that tells an approachable story as opposed to simply presenting content. 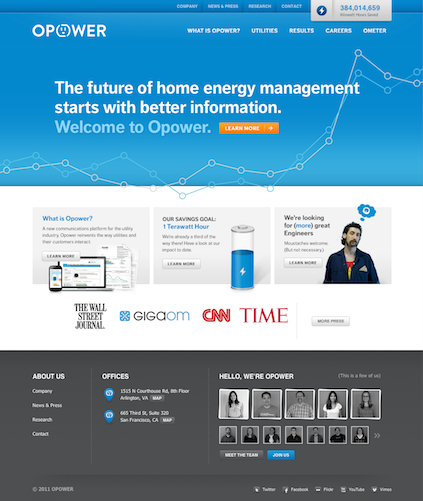 Through the course of our relaunch effort, Opower hired dozens of employees and even refreshed their brand. This ongoing maturation of the company presented some challenges, but more opportunities. Not only were we setting the style, tone and positioning of the site, but we were also influencing the brand at large. Opower pushed us to test certain visual directions and concepts through the lens of adopting those elements beyond the site. These exercise(s) were challenging, but most certainly worthwhile and fun. Four swift months later the refreshed face of energy efficiency is online and happy (and sometimes winking). And it should be. The new site is a much better reflection of the culture and continued success of Opower, and a positive story-telling device to express who the company is and the industry they are leading.